Review published in IJPE, Vol. 4, No. 3, July 2008, p. 298. Prof. Kumamoto has previous experience of authoring four classical books on safety and risk in joint authorship with Professor E. J. Henley of the University of Houston and the books were published by Prentice Hall and IEEE Press (two each). Naturally, the present book has well-planned and structured list of contents reflecting the previous rich experience of the author particularly in the area on risk and safety systems design in relation to nuclear plants. There are many books available in the literature on risk and probabilistic risk assessment (PRA) but the reviewer would like to place this book among the best and highly informative books. 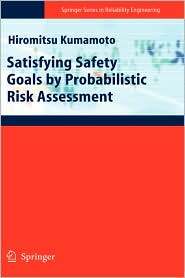 Starting with safety Goal statement of 1986 of US Nuclear Regulatory Commission (NRC), quantitative safety goals, and quantitative health objectives (QHO), the author takes a reader ride through "How safe is safe enough?" and how the uncertainties in a PRA can be minimized. Accidents and public perception and confidence are dealt with nicely through terms borrowed from nuclear safety like (Core Damage Frequency) CDF, Conditional Containment Failure Probability (CCFP) and Large Early Release Frequency (LERF). Since risk-based integrated decision making, makes use of numerical risk-value estimate, chapters 5, 6, 7 and 8 take a reader through the nitty-gritty of PRA quantification and associated uncertainties problems in a logical sequence. The concept of protection layers (IEC 61511) in process industry is referred to as "defence-in-depth" concept. Tolerability of Risk and ALARP, individual and societal risk are all explained in context of nuclear hazard. Chapters 1-4 basically discuss methodologies and concepts. Since the reviewer didn't have the opportunity of going through all the earlier books by the author, it is not possible to comment on how they differ from the present version of the book. However, it can be said with certainty that the book under review is well-documented to deal with the subject of PRA and how safety goals can be met. The risk-informed safety goals require categorization of structure, systems and components and human actions from the point of safety. These have been dealt with explicitly in the chapters 1-4. Chapter 4, in general provides framework for hazard identification and risk reduction. Overall, the book succeeds in its objective to a very large extent and the reviewer would like to recommend this book to any one who intends to get graduated in the intricacies of risk quantification and risk-informed decision making. The book would be found very useful by those involved in nuclear industry. The book will be also useful to graduate students of engineering and technical institutions. Review published in the International Journal of Performability Engineering, Vol. 4, No. 3, July 2008, p. 298.